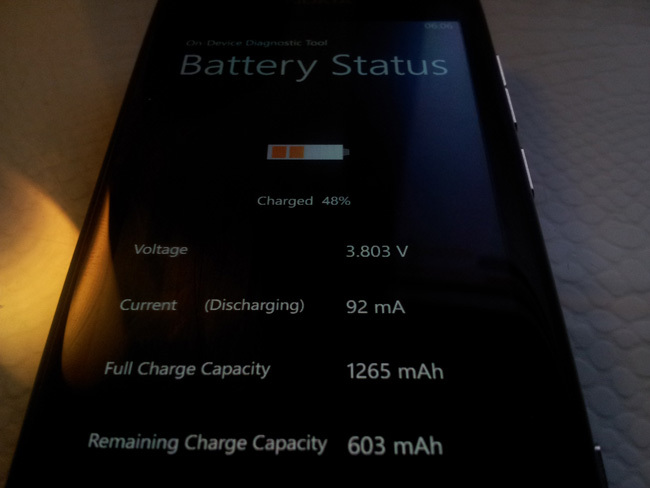 How do I access the full battery status diagnostic in my Lumia 800? But the "Full Charge Capacity" and "Remaining Charge Capacity" options don't show at all. Am I missing something? According to this article it appears that the latest firmware has messed up the Battery Status icon as well as the application, consider looking for a way to downgrade or attempt to contact Nokia to resolve the issue you are experiencing. I haven't read it in detail, but perhaps the battery fix I posted above fixes this (or causes this); in any case, be on your guard when down/upgrading to make sure what it will do. Not the answer you're looking for? Browse other questions tagged battery lumia or ask your own question. How do I replace the battery in my Nokia Lumia 920?